Here You Come Again, released in 1977, is the 19th solo studio album by Dolly Parton. The album included Parton’s first significant “crossover” success, the Grammy award-winning title single, which scored #3 on the US pop singles charts during the early months of 1978. Both the album and title single also scored #1 on the US country music albums and singles charts respectively. “Here You Come Again”‘ was a rare example of a Parton success that she did not write herself; it was composed by the songwriting team of Barry Mann and Cynthia Weil. In addition to four of Parton’s own compositions, the album also included work by Bobby Goldsboro, John Sebastian, and Kenny Rogers. In addition to the title single, Parton’s composition “Two Doors Down” also scored on both the US pop and country music charts. After the success of the title track on the pop charts, Parton rerecorded “Two Doors Down” in a more laid back, pop style several months after the album’s release, releasing the new version as a single, and also having it replace the original version of the song on subsequent pressings of the album. The single version of “Two Doors Down” was released along with “It’s All Wrong, but It’s All Right” as a double-A-sided single in April 1978, scoring #1 on the U.S. country singles charts, and scoring the top twenty on the U.S. pop music charts. The song had also been a top-ten country music success for newcomer Zella Lehr earlier during 1978. 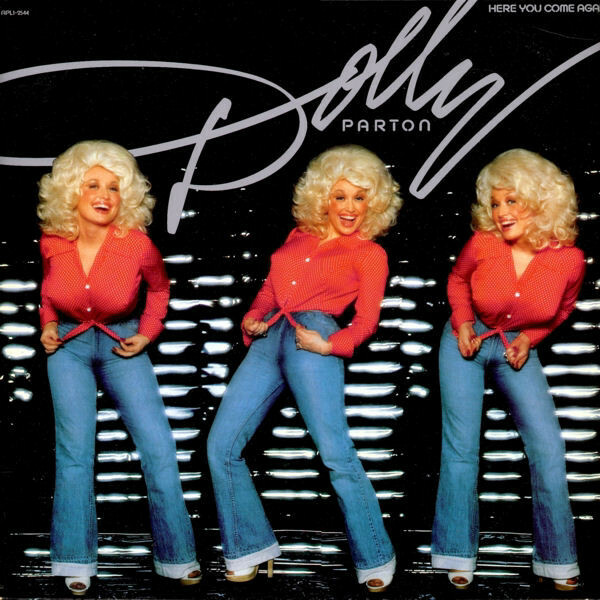 Initial reaction to Here You Come Again was mixed, with many critics and fans disliking the more “produced” sound of the album, though it proved to be Parton’s first album to be certified platinum by the Recording Industry Association of America, for shipping a million copies. The album stayed at #1 on the Billboard Top Country Albums chart for nine consecutive weeks. It stayed in the Top Ten for 35 weeks. The album’s vivid, color-saturated cover was designed by graphic artist Ed Caraeff, who would also create covers for Parton’s next two albums. The distinctive “Dolly” signature logo, created by Michael Manoogian, would become Parton’s de facto logo, appearing on all of her solo albums for the remainder of her association with RCA, as well as much of her promotional material.